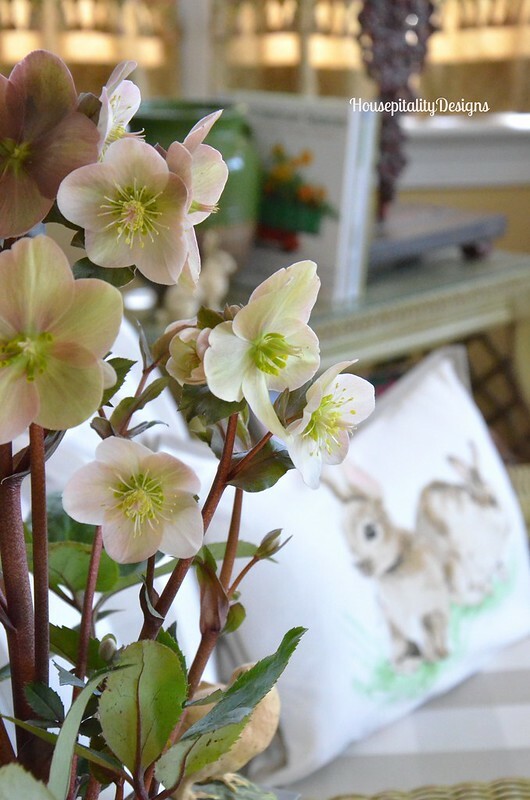 It was time to add Spring to the sunroom. of a soft blues and greens. Spring . 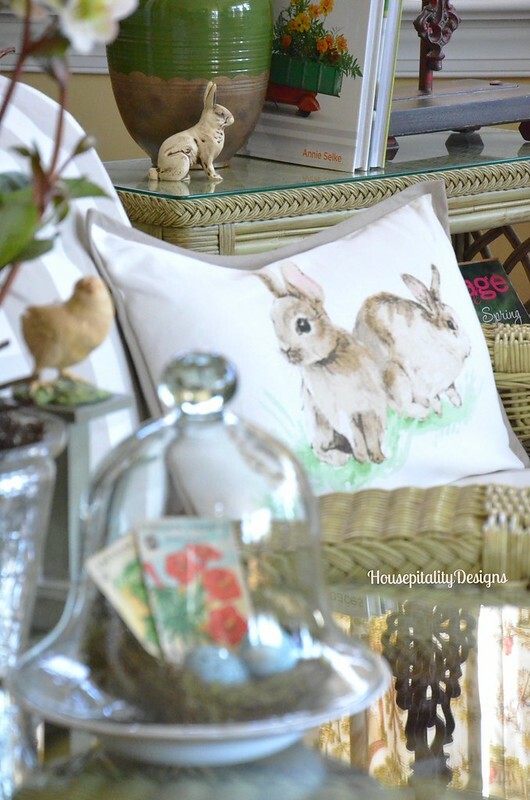 . . when we love to bring out the bunnies and garden decor. under a porch (as they nest in mine) or under a wonderful cloche. 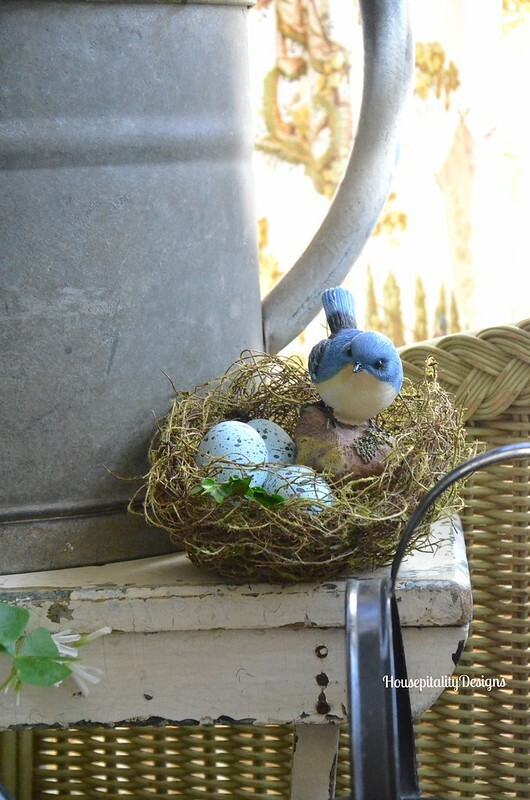 A nest tucked beside a vintage watering can. 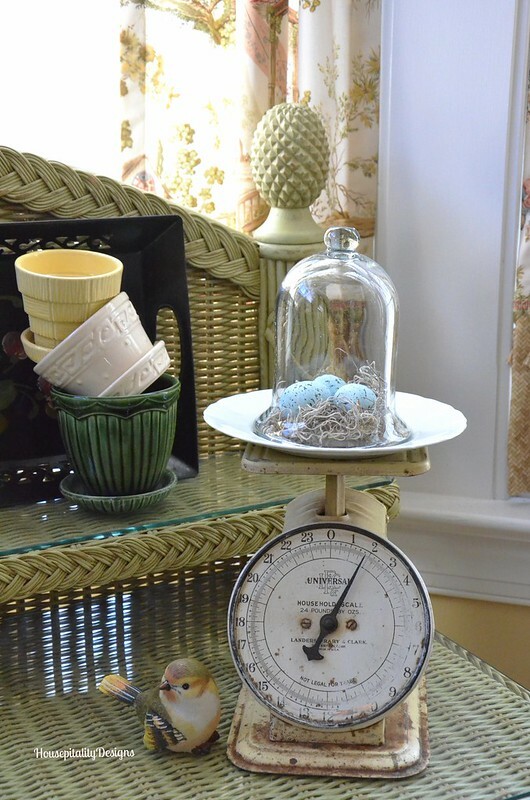 I love decorating with vintage items in the sunroom. 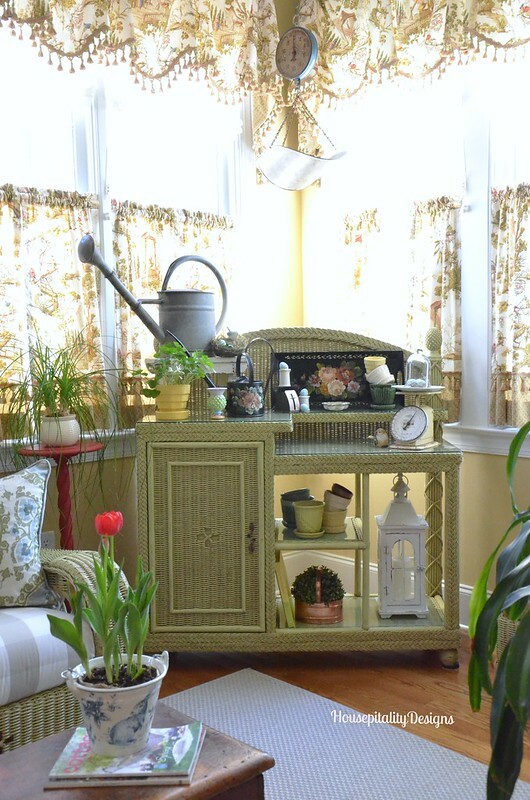 The potting bench that is my very favorite piece in the sunroom. 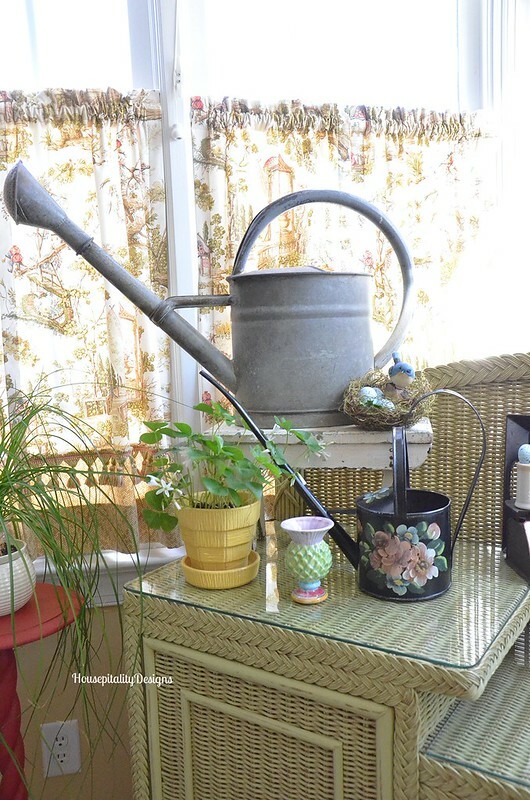 The vintage watering cans are pretty much a staple in the sunroom all year round. with the vintage gate as a backdrop. 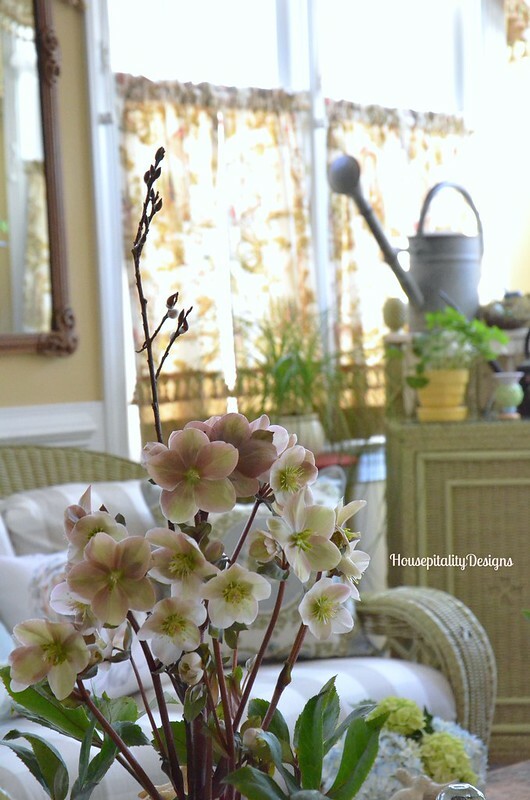 like this beautiful Helleborus that sits on the sunroom end table. When my hydrangeas bloomed, they bloomed in late Spring. I am hoping that they bloom this year, as they have not in the past 2 years. So I must rely on the grocery store to get my hydrangea fix. 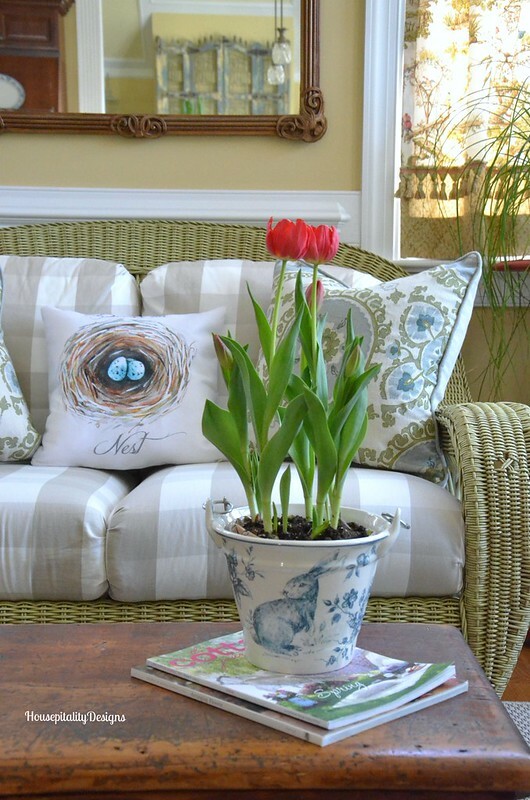 The pillows are new to the sunroom. and the nest pillow is designed by Craftberry Bush and sold through Society 6. 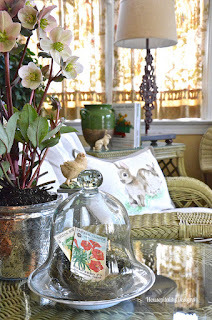 The sunroom was ready to greet the First Day of Spring. 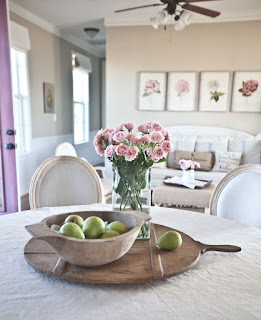 in presenting beautiful inspirational rooms for Spring. 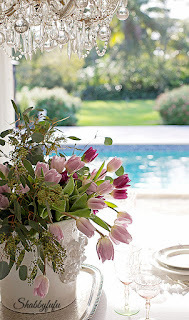 and Design Party and see how you can gain some glorious Spring inspiration for your home! Shirley this is my favorite room! 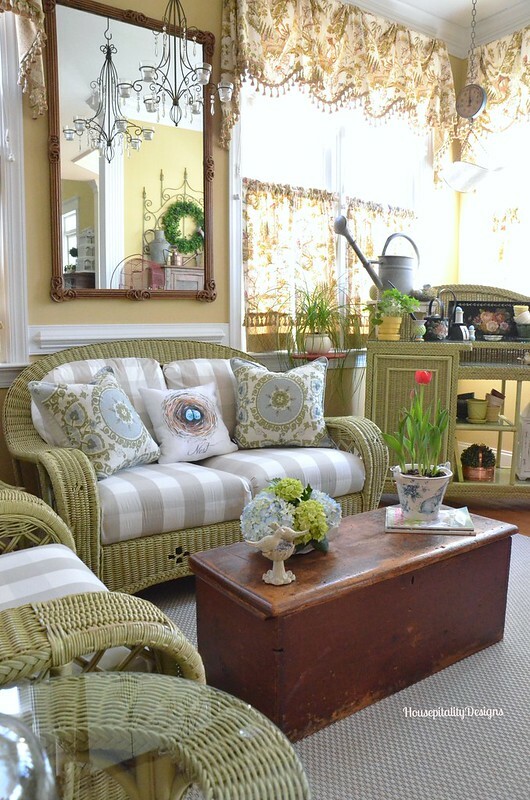 I love the green wicker, that alone is Spring in full on mode. 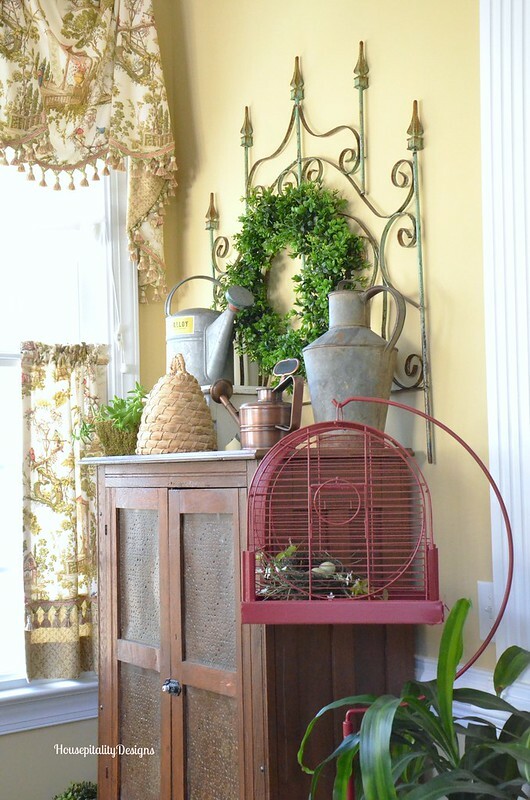 But your potting table with tole tray and the little touches of birds nests and cloches, its just a delight! Shirley, your whole house is beautiful but I especially love your sun room with its garden theme! All the details are so sweet and charming. I would love spending time in here! 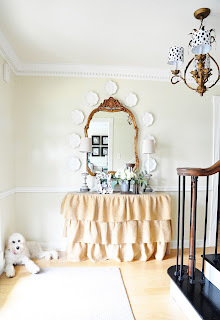 Love all of your vignettes Shirley…so tastefully put together! 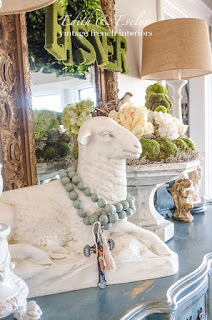 Pinky at designs by pinky’s recent post…A “Chicks” Table!! 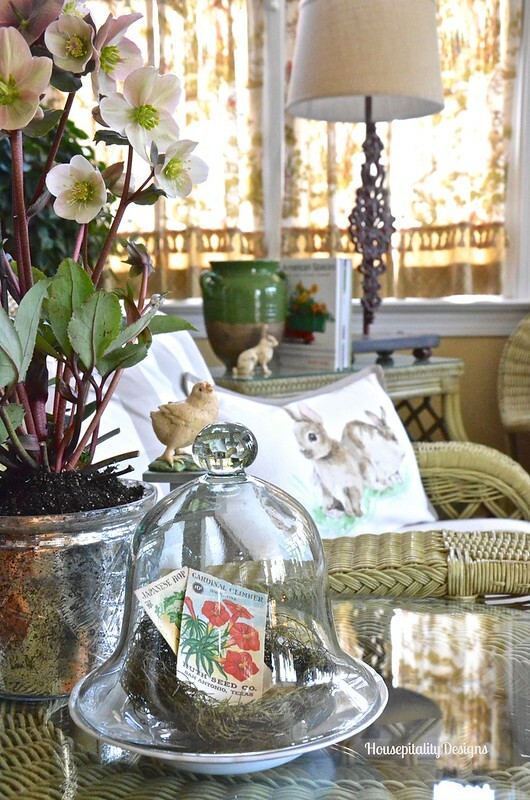 Your beautiful sunroom exudes spring. 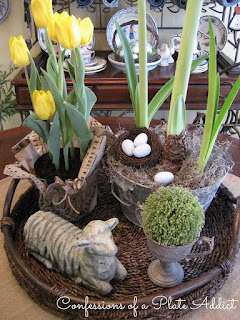 Love the birds, nest, eggs, bunnies, flowers and all the soft colors of spring. Great new pillows and love Lucy’s pillow. She is such a talented artist. Wishing y’all a wonderful Easter weekend!! Pam Richardson’s recent post…What’s Your Friday Plan? So pretty! I love the pillow! What a fresh and pretty space to spend time in! This room just tweets spring. So pretty and you know, it’s my fav. 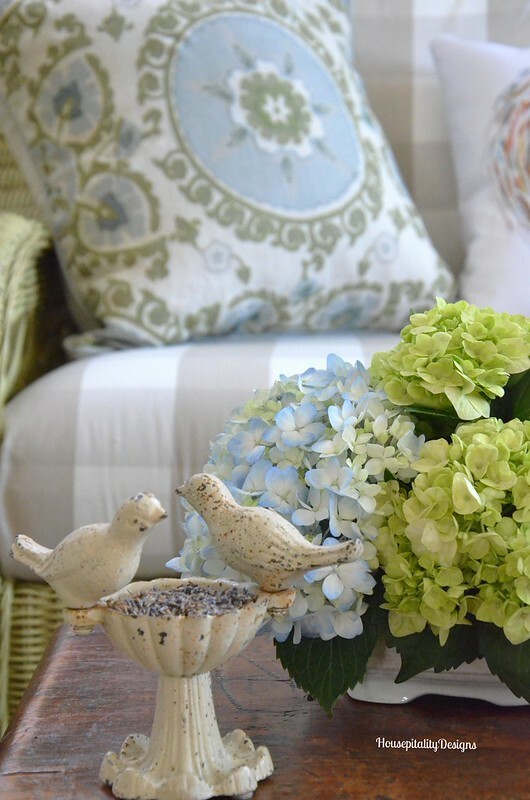 Love the spring touches you added to your sunroom! The new pillows are beautiful too. Des’s recent post…Happy Good Friday! 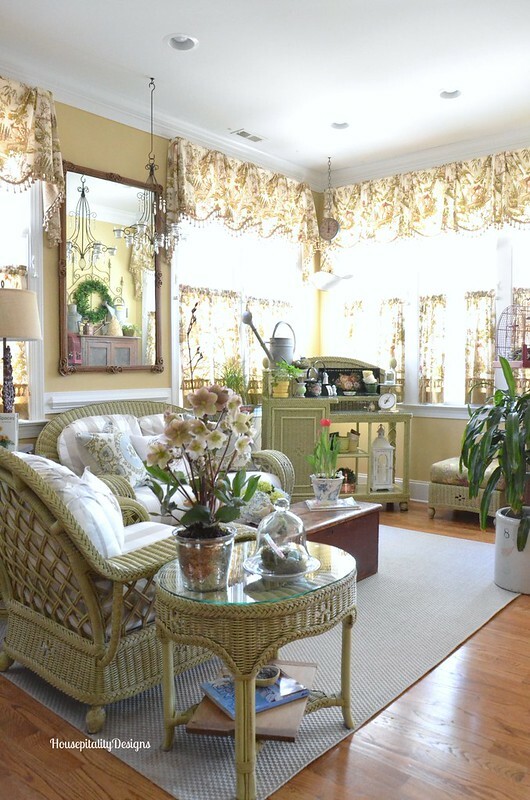 Shirley, what a gorgeous sunroom all decked out for spring! I am in love with that potting bench! Shirley, what a happy room this is! So pretty and inviting… 🙂 I love your vintage touches, but I also love your pillows and the gorgeous florals in front of them!! Enjoy your Easter weekend!! So pretty Shirley. Love all your spring touches. Happy Easter. What a beautiful, springy room! 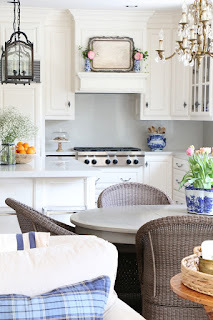 I love all the natural light and touches of Spring you have sprinkled in! Gorgeous!! Shirley your sunroom is so light, bright, and cheerful! I love the new pillows from Pottery Barn; great ideas! Happy Easter! I left a comment awhile ago and don’t see it??? 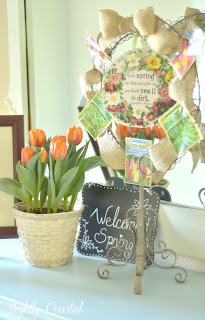 Pinky at designs by pinky’s recent post…Spring WELCOMES you!!! The pillows are so pretty. The whole room is so inviting and says come in and enjoy. I ♥♥♥ your sun room especially with the soft blues and greens, it is my favorite room in your house. Great job and such pretty touches! Beautiful! 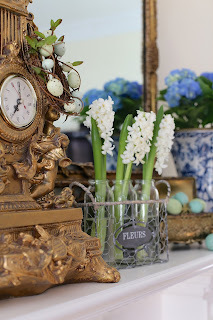 I love all of the sweet spring touches. Those colors in your sunroom are very soothing to me, Shirley, and I’m using similar tones. The bunnies are doing what bunnies do – multiplying! I have the same pillow. 😉 Love all your live flowers, especially the hellebores. Have a nice Easter weekend, Shirley. This is my favorite room in your house and you always have it decorated so beautifully. I would love to sit there all day. I hope you have a very Happy and Blessed Easter. Shirley, I have gone back and forth, up and down, trying to decide which arrangement or vignette Is my favorite. I give up! I simply can’t. 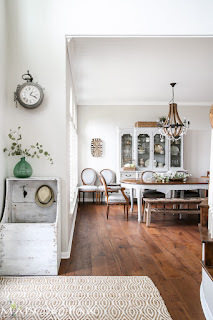 I love this sunroom! What a profusion of the loveliness of spring! Thank you for sharing your time and talent with us. It’s a gift! It’s beautiful! Happy Easter! Shirley, you really have a knack for transforming a space into such beautiful areas to spend time in. I love your sunroom. 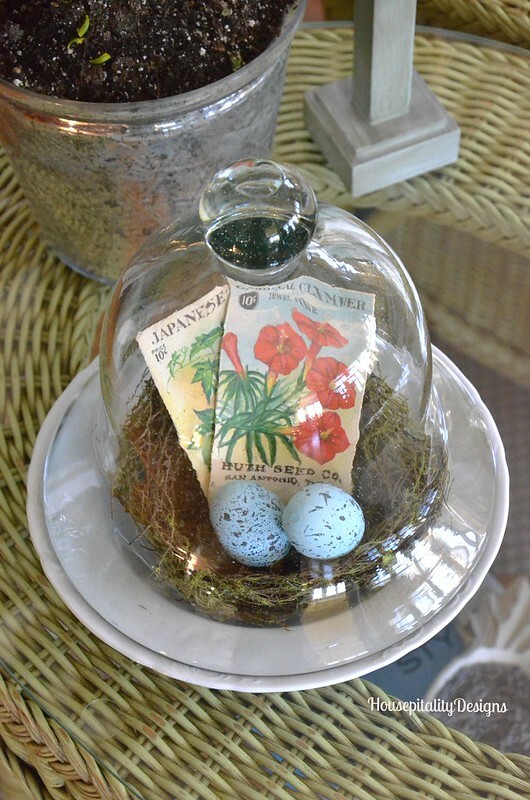 I love the bell shaped glass dome with the seeds and nest in it. Really springy! Your blog makes me happy. Love those pillows…everything is so pretty!! Have a Blessed Easter! Absolutely GORGEOUS, Shirley! 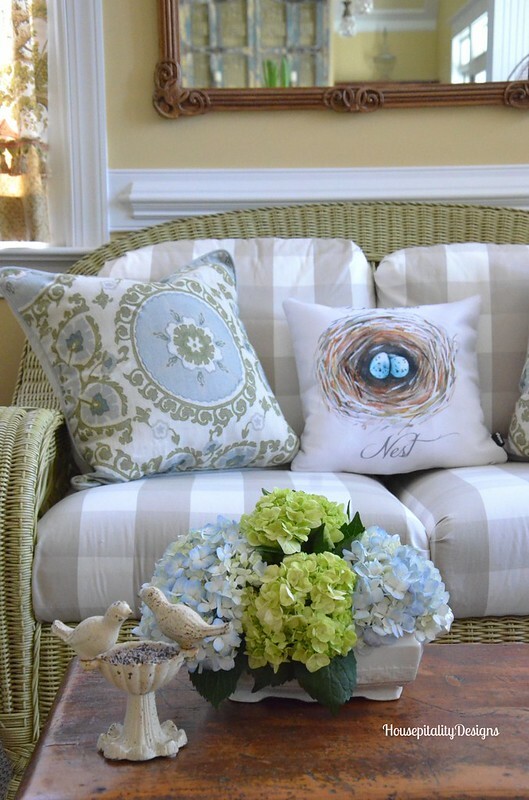 Your sun room is so pretty and I love the Spring pillows. Shirley, I love seeing your sunroom anytime of the year. It has to be my favorite room in your pretty home. The Spring touches are just right to bring in the season. Happy Easter! Shirley, no matter what season it is, your sun room always shines! 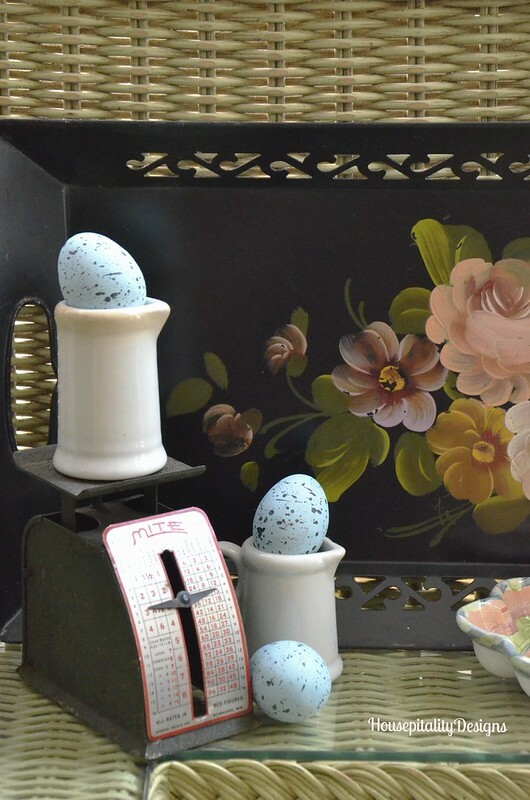 I’m loving the combination of the blue and green that you’ve introduced into the room for spring, and, of course, the gardening accessories. Have a happy and blessed Easter! It looks lovely, and having been lucky enough to view it in person, it’s just as cozy and welcoming as it looks in the photos! 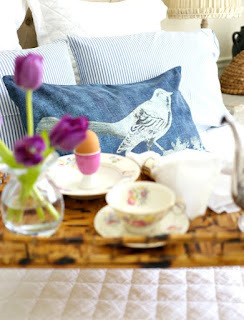 The nest pillow and all the nests and eggs are just perfect. We’ve got a real one in the ivy above my front door–a mama bird has chosen it as her safe spot. Hope you had a Happy Easter! Such a happy place. Your home looks so fresh and inviting!! Thank you Shirley for sharing your home with us. Everything looks dreamy Shirley and I especially LOVE the nest pillow! Society 6 has so many cute ones! Spring suits your lovely sun room well Shirley. 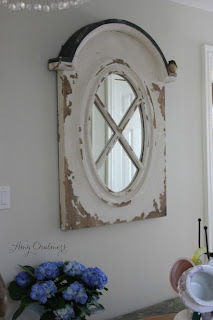 I adore everything, especially the chandy and the way it is reflected in the mirror. The colors are so very soothing, and it beckons you in to sit a spell for some sweet tea :). Looks like I am not the only one who did some blog redesigning! I like the fresh new look! So bright, fresh and airy! What a lovely room. Looks like a great line up of inspiration to click on too. Thanks for sharing it all! Hi Shirley! 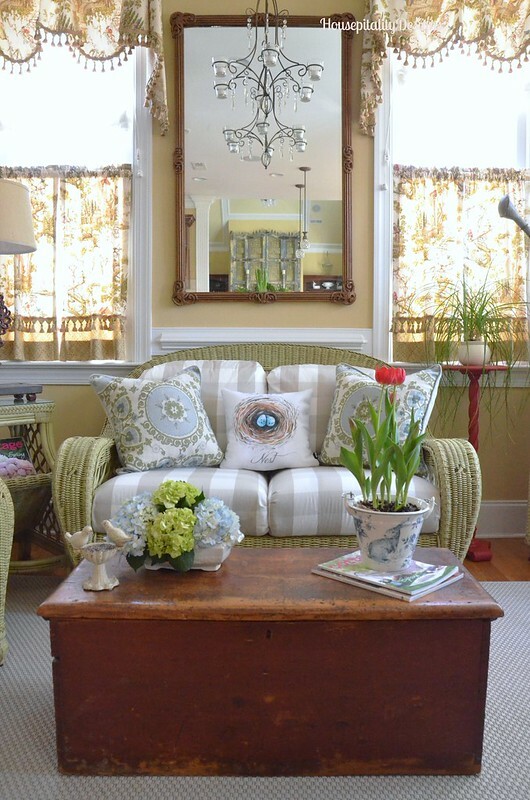 OH, you know how I adore your beautiful sunroom! I love it all dressed up for spring. You have the prettiest things to adorn the room with! I would probably sit out hear all of the time! Thanks for popping in to see me. Hmmm whatever you done Shirley, but it looking really beautiful as I do see it.